Shawn has had some memorable times behind the plow and he recalls a particular storm that hit hard with a whopping 24 inches. That’s over half of what the area usually sees in a season. 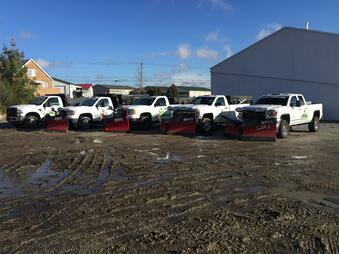 He goes on to say that he and the other professionals at Midwest Landscape ran the BOSS plows, three 9’2” VXTs and one 9’2” DXT, for 72 hours straight and smashed through stacked snow walls without an issue. Talk about a long work day! After the job was done and the storm subsided, he recharged and slept for the following three days and we don’t blame him. With Northwest Indiana seeing an average of 20 snow events in the year, we wanted to know what got Shawn into the snow removal business. He explained that it was simply his passion for snow. He loves plowing because for him it’s fun to load up the trucks, blast some music and push the snow around hour after hour. When he gets ready for a big storm, Shawn only rests easy when he knows the trucks are gassed up and completely loaded with salt. And when the storm finally hits, he grabs some Monster Energy Drinks, turns up the AC/DC and hits the road. Even if he’s plowing well into April, one of Shawn’s proudest accomplishments is not having a single complaint from his customers even throughout the snowiest of winters. His advice for anyone in the business: Don’t sleep in the winter. Based on the story we heard before, Shawn has probably got the right idea! We salute Shawn and all of the other snow removal professionals out there for restoring order during the winter months. Thanks, Shawn, for being a BOSS Owner!